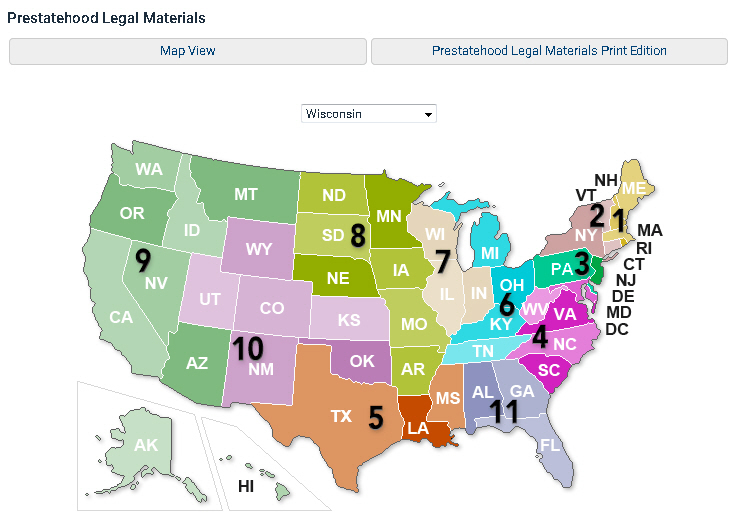 Researchers trying to locate primary law materials from US colonies all the way to statehood can turn to a single source: HeinOnline's Prestatehood legal materials. It's easy to use! From the main page of the collection, use the map to navigate to the geographical area (state) you're researching. You'll get an overview of the history and dates pertinent to your research, along with suggested sources for constitutional, judicial, legislative, and executive materials. Sign into this database with your library card. HeinOnline is available to most cardholders outside of the library, and all visitors to our three libraries can use HeinOnline from a law library computer or wireless network. Information has been adapted from the book, Prestatehood legal materials: a fifty state research guide, including New York City and the District of Columbia. The print edition is also available digitally from HeinOnline's prestatehood collection. The author of Wisconsin's entry, Duane Strojny, notes in the conclusion, "A quick phone call to the Wisconsin State Law Library will confirm actual content and the existence or appropriate referral to obtain a copy of documents." Yes! Please call or email us with questions. We're happy to help.